Check out that arm party of yours. If it's anything like ours, it includes just as much silver and gold as it does neon, braided string. The goal is to adorn your wrist with a mix of casual pieces and those that are more elegant. So, you can imagine our excitement when we found a couple of cuffs that strike said perfect balance all on their own. New York-based designer Jill Golden has teamed up with J. Crew for her ISARO collection, which is inspired by her love for exploring new cultures. 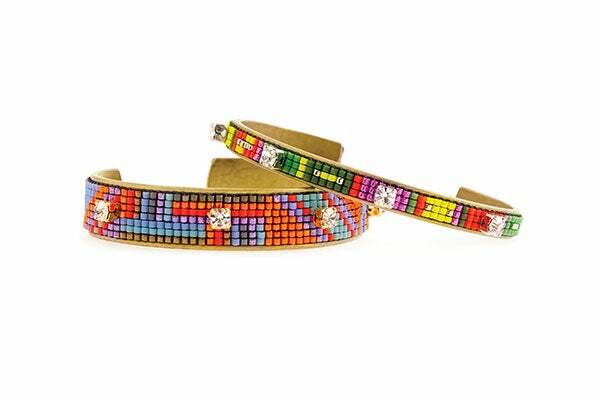 The pair of multi-colored bracelets are made from Japanese glass beads, simple bends of brass, and embellished with square Swarovski crystals. The thinner band, aptly titled "Let's Dance" is perhaps a more coquettish addition to your pre-stacked bangles, while "A-List" is a bit of a bolder move. But, since this particular collaboration happens to benefit Indego Africa, a social enterprise with a fair trade approach, we think you should obviously consider investing in both styles. All profits go to the education of Rwanda's artisan women, who handcrafted these gorgeous accessories that'll lend a playful touch to your beloved J.Crew staples. You can pick up both "Let's Dance" and "A-List," which retail for $88 and $95 respectively, in select J.Crew stores and online right now. And, don't worry if you can't still stitch your bestie a friendship bracelet like the one you made in summer camp, these bejeweled bands are pretty much the perfect update.